In 1999, Time magazine included Keynes in their list of the 100 most important and influential people of the 20th century, commenting that: "His radical idea that governments should spend money they don't have may have saved capitalism." In addition to being an economist, Keynes was also a civil servant, a director of the British Eugenics Society, a director of the Bank of England, a patron of the arts and an art collector, a part of the Bloomsbury Group of intellectuals, an advisor to several charitable trusts, a writer, a philosopher, a private investor, and a farmer. St. Louis: St. Louis, 1917. Autograph Letter Signed by J.M. Keynes To Oswald Toynbee Falk, a stockbroker and a close friend of Keynes. "[St Louis approaching New York] 11 Sept 1917. My dear Falk, I have had the enclosed letter from Herbert Samuel and have promised to do my best to secure such an article as he indicates. Will you try your hand? I should be very grateful if you would. I suspect that in your usual way you will disclaim the competence. But I would undertake to be the judge of that. In any case you might perhaps fortify yourself with collective wisdom by getting your dining party to discuss it first. I am not sure it wouldn’t prove a very instructive topic. If so, perhaps I might bring Mr. Samuel as a guest? I expect to be back in England by the end of the first week of October. Sincerely yours J.M. Keynes." Written on printed letterhead of the Royal Economic Society, Kings College, Cambridge (From Mr. J. M. Keynes, Editor of the Economic Journal). Housed in a custom half morocco clamshell box. Letters signed by Keynes seldom enter the marketplace. London: MacMillan & Company, 1931. 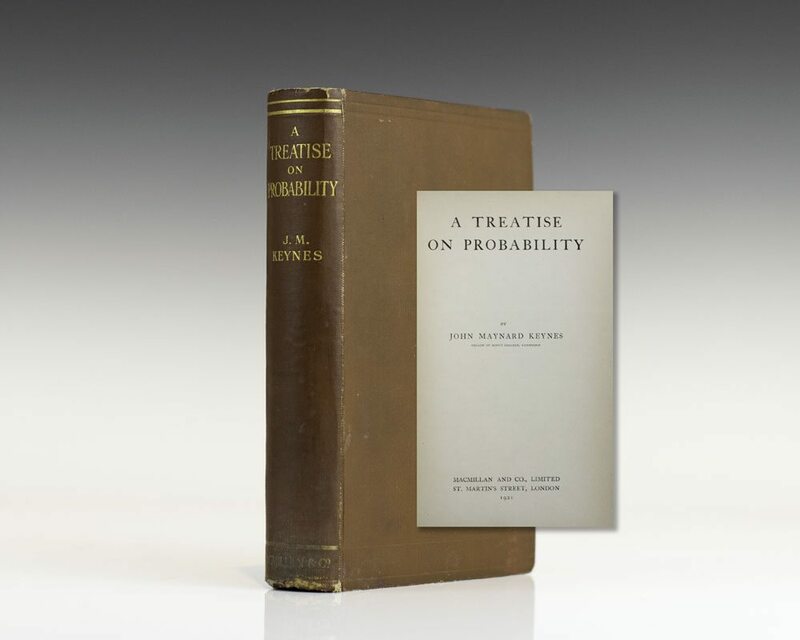 First edition of Keynes’ first volume of collected essays. Octavo, original green cloth. Near fine in the rare original dust jacket which has a few small chips and wear.